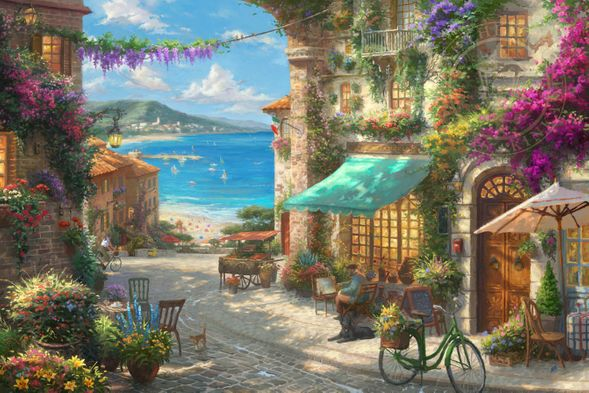 Thomas Kinkade Limited Edition Giclee on Paper and Canvas:"Italian Cafe "
About the Art: If ever a place could whisk away the troubles of the day, it would be here. Once a fisherman's harbor, now this quaint southern Sicilian village draws weekenders, beach-dwellers, and romantics. At every turn, the streets and piazzas are lined with stalls of fresh and local food; aubergines, fish, zucchini, tomatoes, and almonds. Like they have for centuries, the shop keepers have watered down the streets and entryways to limit the dust and sand that had blown in overnight. As the day begin, a young lady fetches a loaf of bread and an elderly painter sets up his pallet and make-shift easel looking to capture the sea and the sails. Although Michelangelo's coffee and pastries are known throughout the island, the cafe offers more than just sustenance for the body, it also offers a timeless encounter with Italy's flora and fauna, a complete reprieve for the soul. Italy's national flower, the Lilly can be seen in the corner of the painting. A seat has been saved for you as well, along with a bottle of grappa and coffee, the perfect place to wile away a few hours in conversation�or silence. Three blue birds are hidden within the scene. While the first two can be spotted quite easily, the third has already been found by the interested cat in the center of the street�(hint: flowerpots). Peace must be in the air in a place where even cats and dogs would rather lounge and meander than fight. Another cat sits on a stuck ledge, but near her is a place where the wall has cracked and the shape is quite familiar, it is the Italian Boot.